IP Output allows captured data to be sent to a specified IP address and port using either TCP or UDP transport protocols. Zebra recommends that the receiving machine be running Windows and the Zebra IPWedge software, but it's not required. IPWedge is a small Windows app that monitors a network port and receives scanned data sent by devices using the DataWedge IP Output option. 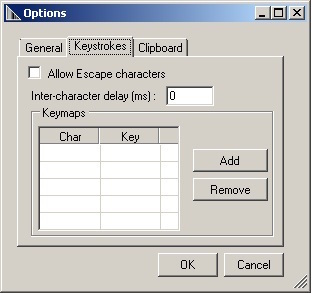 The receiving PC inserts the data as keystrokes into the foreground application or the Windows Clipboard, essentially using the device as a wireless scanner. 1. Locate the IP Output section of the Profile. 3. 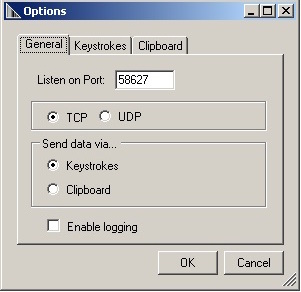 Select the desired Protocol (TCP or UDP) for data transport (default=TCP). 4. Enter the IP address of the system that's running IPWedge. 5. Enter the Port number if other than the default of 58627. 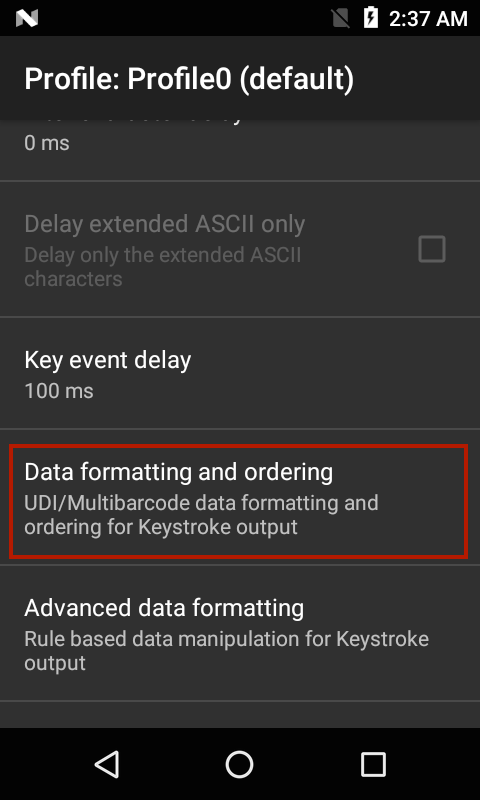 This setting applies when the Scanning mode in Barcode Reader Params is set to UDI, which acquires multiple data points (tokens) as specified in the Universal Device Identifier parameter(s) selected in the above-referenced section. 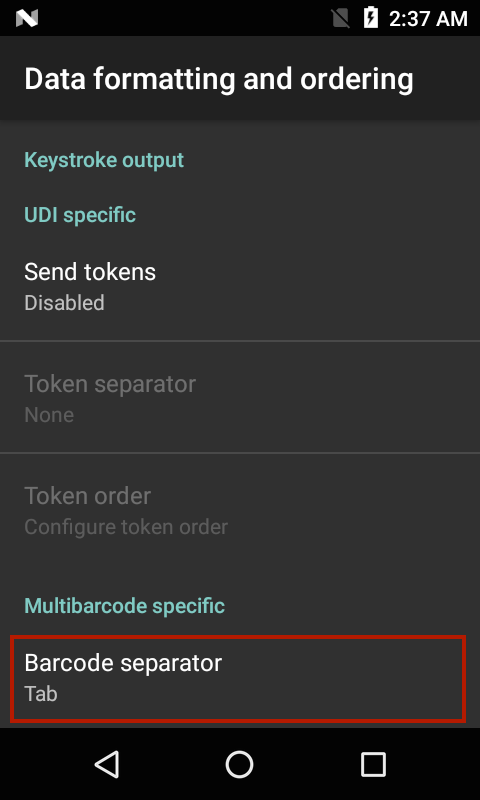 Token selection - allows the output order of acquired UDI data to be adjusted and the optional insertion of a Tab, Line Feed or Carriage Return character between tokens, if required. 1. 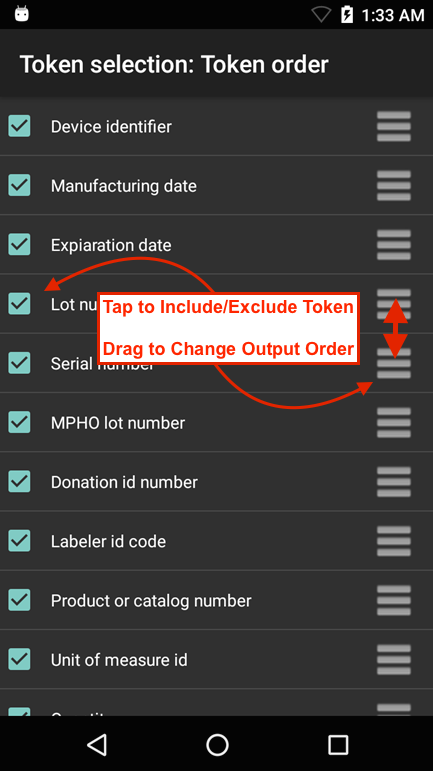 Tap "Send tokens" to select the desired output for acquired UDI data. Tokens only - DataWedge parses the UDI data into separate Tokens for output (separated by a separator character, if selected). Barcodes and tokens - DataWedge sends the barcode string appended by the tokenized data. If no separator character is selected (see Step 2), DataWedge sends two instances of the same data. 2. Tap "Token separator" in the Token selection screen to specify a separator character to be inserted between Tokens, if desired. If "Barcode and tokens" mode is selected, the selected character also is inserted between the two. 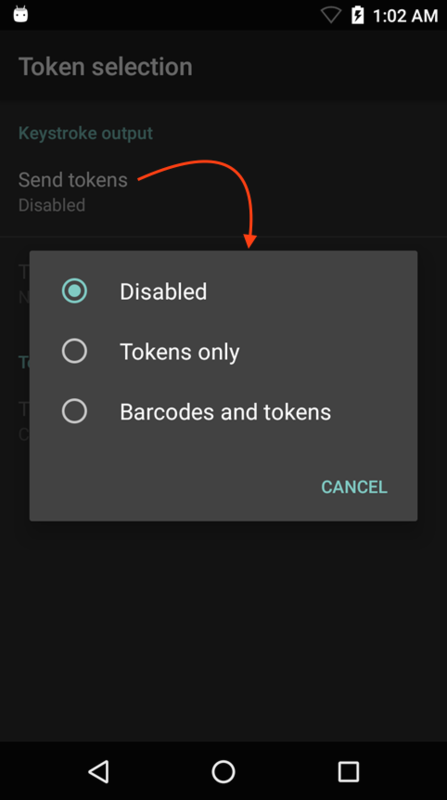 This setting is not available if "Send tokens" is disabled. 3. 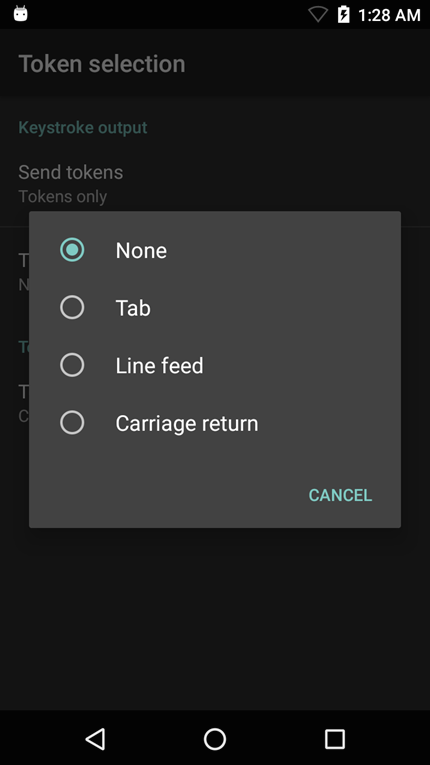 Tap "Token order" to include/exclude Tokens from the output and adjust their output order. Drag tokens to adjust output order. This setting applies when the Scanning mode in Barcode Reader Params is set to MultiBarcode, which simultaneously acquires the number of barcodes (from 2-10) specified in the corresponding reader parameter. Note: Supported on select devices only. See the About page for details. 1. Tap "Data formatting and ordering" to specify a separator character to be inserted between the data from each barcode. 2. Tap "Barcode separator" to specify the desired insertion character (CR, LF or TAB). Data from each barcode is otherwise concatenated and delivered as a single string of keystrokes. To use IP Output to send captured data to a remote device that's not running IPWedge, the system at the receiving end must be running a client app that monitors a port for data coming via TCP or UDP on the port specified on the device as described above. Warning: Zebra does not support this usage scenario. 2. 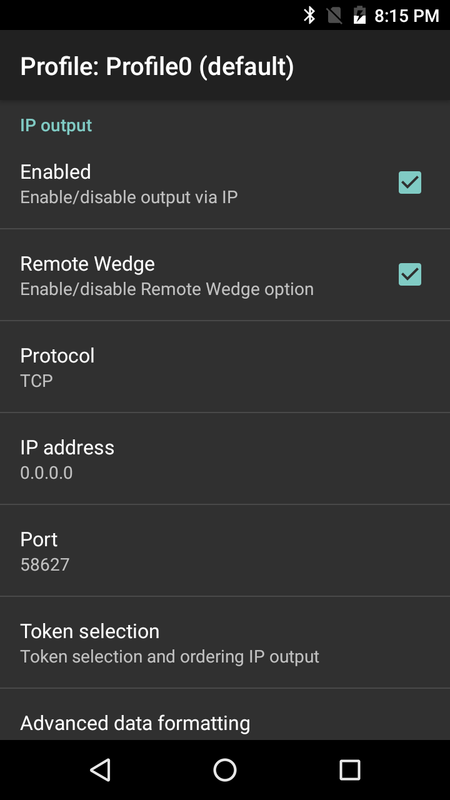 Check "Enabled" box and uncheck the "Remote Wedge" box. 4. Enter the IP address of the server or device to receive the data. 5. Enter the Port number (if other than the default of 58627). Warning: Zebra does not support this usage scenario. 1. Visit the IP Wedge for Windows download page at the Zebra Support Portal, accept the EULA and download. Note: Windows Mobile/CE devices might need a different version of IPWedge. Visit the Windows Mobile/CE download page for more information. 2. Install the .zip file on the system to which the scanned data will be sent. Note: The port number must be the same as that specified in IP Output on the device. 4. Open the IPWedge app from the Windows Start menu or click on the IPWedge icon in the System Tray and select "Options" from the menu. 5. 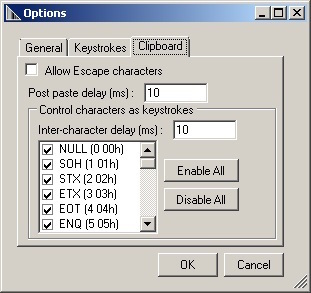 Make any required changes to Options in the General, Keystroke and Clipboard tabs. Click OK on each tab to save settings. The PC is now ready to receive data from DataWedge IP Output (with IP address and port settings matching those of the PC).